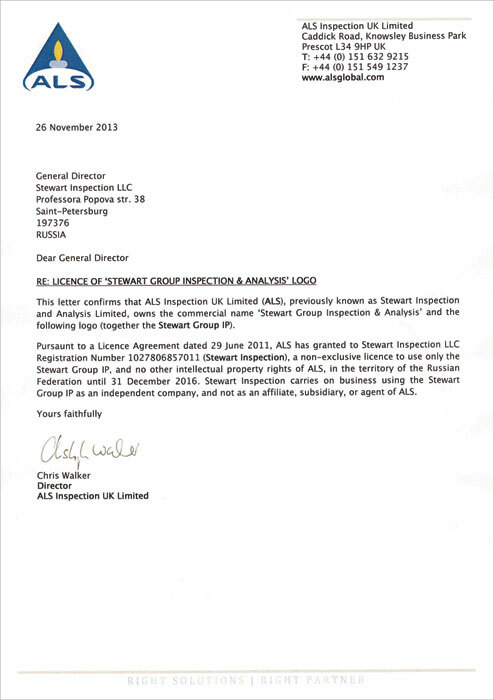 «Stewart Inspection LLC» (formerly Alex Stewart Assayers Rus) - the Russian Independent Survey Company, was established in March 1997, is one of the leading companies on the Russian market that provides a full range of survey services, consulting, sampling and sample preparation, analysis and testing of wide range or products and merchants. The head office of «Stewart Inspection» and it’s main focal point located in St. Petersburg, wherefrom all operations are monitored and all company's activities are managed. As well the company’s Laboratory is also set within head office, to carry out a wide range of analyzes and tests of various materials. «Stewart Inspection», according to the licence agreement, is entitled to work under the Trade Mark of the International Group of companies "StewartGroup", which, in mid-2011 has joined to International Group "ALS". 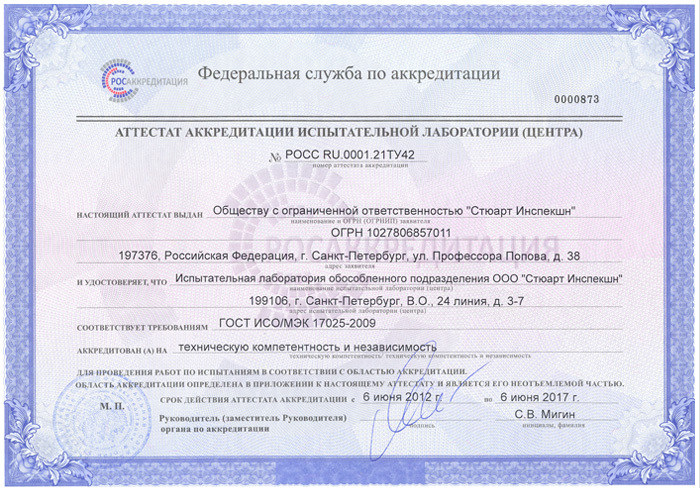 «Stewart Inspection» is certified for compliance with the Quality Management System ISO 9001:2008, is a member of Chamber of Commerce & Industry of Russian Federation. 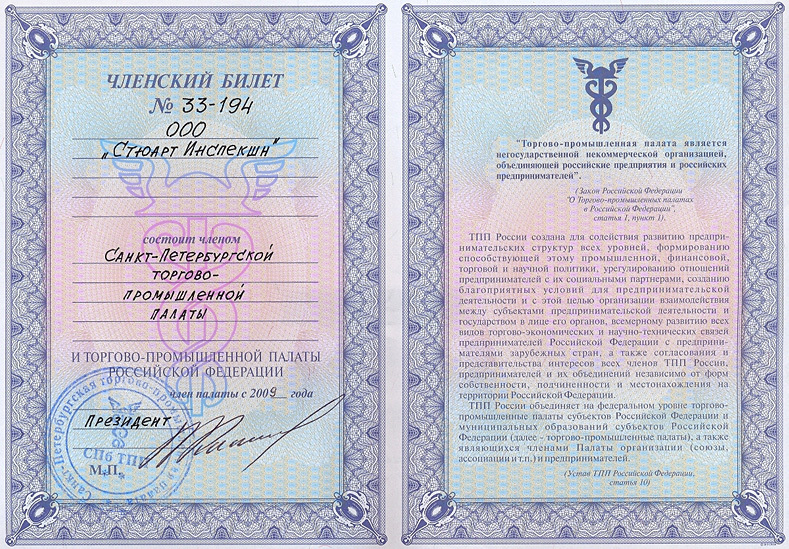 The company has separate divisions and representatives in major Russian cities, such as Kaliningrad, Murmansk, Novorossiysk, Rostov-on-Don, Moscow, Yekaterinburg, Kemerovo, Vladivostok, as well has representatives in some CIS and Baltic countries, thus providing the most timely and high-quality customer service. «Stewart Inspection» strategic plan and activities allows to continuously expand the range of services and maintain their high quality, as well as to build capacity and offer customers new technologies. Survey Services are available for all processes and interactions to the goods related to the merchants: production, packing, loading and unloading, inspection of storage facilities and warehouses, inspection of transportation means of any kind, weight definition, quantity and quality of goods and many others. Highly qualified company’s personnel performs wide range of services for sampling materials, preparation of samples for the tests, the definition of humidity and other quality characteristics of the goods. Laboratory and Assay Division of the Company, through its own Laboratory, provides high-quality analytical researches and tests of various ores and concentrates, ferrous and non-ferrous metals, ferroalloys, iron, steel, non-ferrous metals and their alloys, fertilizers, coal, coke and other materials. One of the main principles professed by «Stewart Inspection», is an Individual Approach of the Client. Through the years the company has developed its own technologies and know-how in the field of survey, which uniqueness has been successfully implemented by providing INTEGRATED SURVEY PROGRAMS for many types of materials and products, together with and exclusively for our clients.